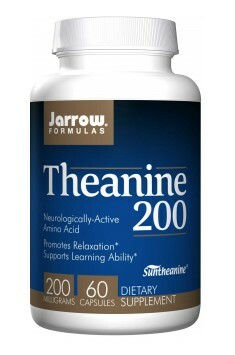 Jarrow Formulas Theanine 200 is a dietary supplement which contains 200 mg of L-theanine in a single capsule. This organic chemical compound occurs mainly in Chinese tea (Camellia sinensis) and it is known because of its ability to promote relaxation without the feeling of sleepiness, which very often occurs during the use of preparations which have a similar effect. L-theanine reduces stress and anxiety mainly because it has some resemblance to the chemical brain indicator – glutamate, but it functions in the opposite direction. While glutamate is one of the most stimulating neurotransmitters, L-theanine can link with the same receptors and block glutamate's action. These properties can reduce the hyperactivity of the nervous system and they calm down, relax and minimize anxiety. It is believed that L-theanine may show the action similar to glutamine, as it is its derivative and has resemblance to it. This also applies to the properties of the neurotransmitters to which glutamine is a precursor. This mainly regards GABA (gamma-aminobutyric acid). There is some evidence that L-theanine may stimulate its production and, as we know, gamma-aminobutyric acid can inhibit the nervous system as well as shows sedative and anxiolytic properties. In contrast to prescription-only anti-anxiety medicines, the use of L-theanine does not cause the feeling of sleepiness and does not weaken the motor functions. In fact, the studies in humans have demonstrated that L-theanine may slightly improve alertness and attention, in addition to its earlier mentioned sedative properties. Especially interesting are the results of the research which showed that supplementation with L-theanine reduced rapid pressure increase, which some of us experience in stressful situations. Such dangerously high blood pressure and its rapid increase can cause arterial damages, mainly in the network of tiny brain vessels. There is a link between anxiety, response to stress and one of the most basic brain functions – maintaining cognitive skills. The latest studies indicate a potential role of L-theanine in promoting cognitive skills and preventing their loss. Stress has a strong negative impact on the ability to think clearly and to make the best decisions. Physiologically, it has been demonstrated that psychological stress significantly reduces animal performance in the standard tests of learning and memory and increases the damage caused by free radicals and secretion of adrenaline. Application of L-theanine before the exposure of test subjects to the stress factor resulted in a reversion of impairment of cognitive skills as well as in a reduction of the levels of stress hormones and oxidative damages. Stroke is a result of a sudden blockage of blood flow (ischemia) to the brain. L-theanine may have the properties which will have a beneficial influence on the prevention of strokes and relieving the damage if they occur. There is some evidence which suggests that L-theanine may significantly improve the production of nitric oxide (NO) in the vascular endothelium of arteries. As we know, NO has an antispasmodic influence on smooth muscle cells of blood vessels and hence, on the blood pressure and the regulation of blood circulation. Another mechanism of strokes prevention has been described by another study. It has been demonstrated that L-theanine decreased the expression of adhesion molecules to the walls of the vascular endothelium, by inhibiting cytokine TNF-alpha (tumour necrosis factor). Such an action is characterized by a reduction in the risk of clots, blockage and obstruction of the arteries which cause strokes. L-theanine, applied to animals up to 12 hours after stroke, resulted in beneficial changes in protecting brain cells and reducing the size of the destroyed areas of the brain. Even a later treatment (24 h) improved neurological condition of the test subjects. The scientists are even more interested in the properties of L-theanine, which go beyond the calming effect. Over-stimulation of brain cells with glutamate is believed to be one of the factors of the development of neurodegenerative diseases. The possibility to block it makes the L-theanine remain a promising agent in neuroprotection and prevention of the nervous system diseases. Although the deeper mechanisms are still under investigation, there is some evidence that L-theanine affects gene expression in the areas of the brain which are responsible for fear and aggression (amygdala) and memory (hippocampus). This can be helpful in integrating behavioural responses to stress and experiencing post-traumatic stress disorder and mood disorders. To sum it all up, Jarrow Formulas Theanine 200 is especially recommended, due to its nootropic properties, for all people who are exposed to excessive mental and physical effort. It is also recommended for athletes whose disciplines require concentration and memory skills, and for those who suffer from disrupted regeneration, caused by chronic stress. The supplement can also be used by people in the periods of increased learning (during exams), and by those who intensively work mentally and for long periods (for example during major projects and works). Theanine 200 200mg 60 caps. Butcher's Broom is traditionally used for hemorrhoids and for symptoms of poor blood circulation.